In a career spanning nearly fifty years, Isaac Asimov—science writer, historian, and futurist—accurately predicted how technological breakthroughs would be developed and utilized, years before they became reality. His foresight envisioned calculators, computerized cars, and advances in the field of robotics as he chronicled in such popular books as I, Robot; Robots and Empire; and The Robots of Dawn. 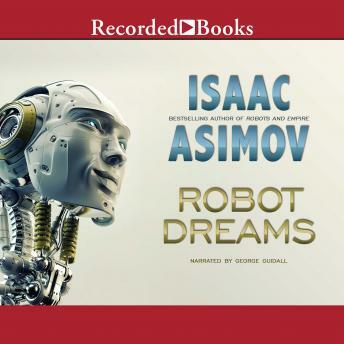 Robot Dreams spans the body of his fiction from the 1940s to the mid ’80s, featuring all of the classic Asimovian themes—from the scientific puzzle and the extraterrestrial thriller to the psychological discourse. In addition to the title story (a Locus poll winner and Hugo and Nebula Award finalist), this collection features several of Asimov’s robot tales. A robopsychologist must outwit a machine determined to stay hidden in “Little Lost Robot”; a woman’s talent for “Light Verse” overshadows her true accomplishments with her robot servants; “The Last Question” presented to computer after computer over a hundred billion years may remain forever unanswered … and seventeen more future visions from the grand master of science fiction. I'm not a fan of futuristic/syfy books but I found the title interesting, so I took a chance. The author caught my interest right off. Robot Dreams tells multiple stories, colliding into one thought...that technology will (or maybe always was) be a force we will have to reckon with. The narrator's voice was a good fit for this book, in my opinion. I hope to encounter George Guidall in future audio books.